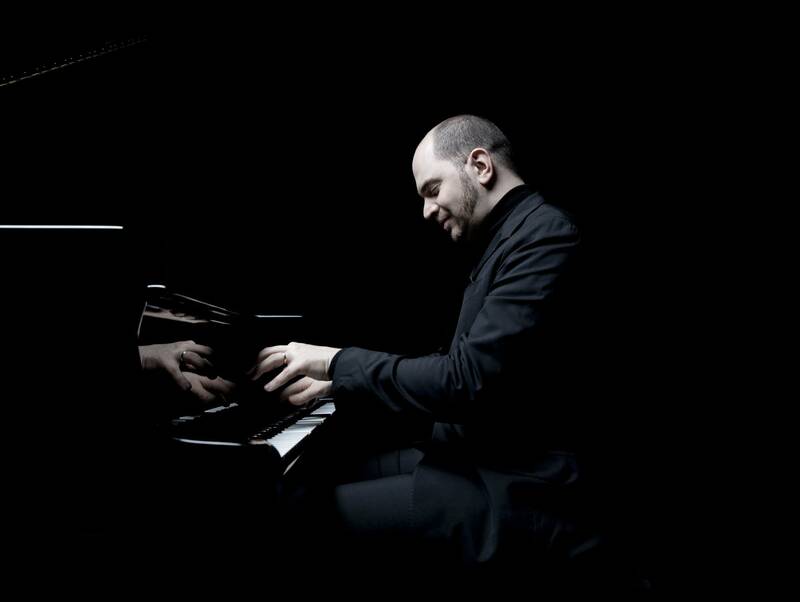 Kirill Gerstein is an award-winning classical pianist with one foot in the world of jazz. That's why his new recording, The Gershwin Moment, with the St. Louis Symphony and conductor David Robertson, is such a good fit. Kirill, let's start off by talking about your experience with jazz music from a very early age which really came from your parents' extensive record collection. What were some of those most impressionable recordings when you were growing up? "The one that does come to my mind that I can clearly recall hearing as a child was the record of Oscar Peterson and Dizzy Gillespie playing duets. I just remember being very attracted by this by the sound of this music that really was unlike anything I was studying in the classical realm. "Actually, my first trip abroad from Russia was to Poland where I won a classical piano competition. But at the time on the streets of Poland, you could buy tapes — I think bootleg tapes would be fair to say — so, I remember for the first time buying and then hearing recordings of Keith Jarrett and Chick Corea. And Bill Evans. And that was certainly revolutionary and mind blowing for my ear." I was thinking about the version that you have of Rhapsody in Blue on this recording which is from 1924 and it is the jazz band version of this piece that Ferde Grofé orchestrated for the Paul Whiteman band. Why did you choose this arrangement? "The oversimplified answer is because I think it is better. But there are some reasons why I think it's better. It's jazzier. It's more compact. I think the band version also allows other influences on Gershwin's music to come through. I think there are certain moments that clearly show the influence of klezmer music that Gershwin heard growing up. "But only a year, year and a half later, the Concerto in F is all Gershwin's doing. So there one sees the staggering progress that he was making as a composer and also as a craftsman. In 1925 he produces the Concerto in F that has incredible orchestration, one that William Walton said that he thought was one of the most terrific examples of orchestration." This recording is culled from four consecutive concerts in St. Louis with David Robertson conducting  each performance unique, even though it's the same repertoire. Unique, though, because you're adding your own embellishments as well as a cadenza in the Concerto in F. Tell me a little bit more about those embellishments and that cadenza in particular. "In these live performances, there were four concerts, and so each night was different. I remember David Robertson saying, 'Well, isn't it going to be difficult to choose which one of the improvisations you keep? Because you had version A, B, C and D.' But that gives it the sort of life quality that sometimes is particularly attractive. It really isn't the same every night." George Gershwin himself performed the Concerto in F with the St. Louis Symphony in 1936. Did anybody have any memories to share about that? Did anybody who was there talk about what that experience had been like with the orchestra way back when? "There wasn't a specific story that was told about the Gershwin visit. But I think there is a deep familiarity and an at-home feeling with this music in that hall. So, in that sense I felt that doing it with the St. Louis Symphony and David was sort of the ideal choice for this repertoire." I want to ask you about an important mentor to you, who also appears on this recording. Tell me how you met Gary Burton. "And Gary and I have stayed in touch in the years since and in 2012 I came back to Berkeley and did a concert and one of the things that we played was this Oscar Levant song that's become a jazz standard called "Blame It On My Youth." "And the reason to include it on this all-Gershwin album is of course because Oscar Levant was a very close friend of George Gershwin and also the pianist that played the Rhapsody in Blue and Concerto in F the most, aside from the composer."